I'm not sure I've ever described a car seat as super stylish.. but this one most certainly can be classified as beautiful as it is functional. The Clek Olli Booster Seat is really a new revolution in the form of backless booster seats, unlike a traditional booster seat that just "floats" under the lap belt and child this booster seat actually utilizes the latch system to latch securely in place as added protection. Something I was unaware of.. but I should share with you "Children under 4'9" tall or less than 80 lbs need a booster seat to ensure seat belts properly fit their small frame." Sadly I am only one inch taller than these provisions... I guess I should be in a booster seat too.. lol.. poor Connor if they pass height regulations on booster seats will never outgrow his at this rate. Regardless you should start using your booster seat from the time your child outgrows his or her forward facing car seat (around 40lbs) and until you either meet your state's requirements or ideally until your child hits the federal guidelines which is over 4'9 and over 80lbs. My state requires all children 6 and under to be in a booster regardless of height or weight. Though I honestly hope by the time Connor reaches booster seat age that requirement has been raised to the national standard so I am not fighting with him when all the other kids are out of their booster seats and I still want him in one! The installation of this seat took virtually five seconds just line up with the latch markers on your seat.. push.. hear the click and your installed. It was the easiest most stress free seat install I have done to date. Even with a regular booster seat I feel as if its not positioned correctly so I end up fumbling around with it a few minutes to make sure its centered on the seat... just no need with the Clek! Sadly my old car does not have Latch connectors though every other car in our family does but regardless we can still us our Clek as a traditional booster seat without the latch installed. Hopefully by the time Connor actually grows into this seat and I will be out of school and I'll have the upgraded (newer) version of my car with Latch! If the blue is not your thing Clek makes the car seat in black, sandlot, blue, and green.. as well as optional jackets that can be purchased separately in pink camo, regular camo (a staple down here), leopard, and zebra prints. Personally I'm a huge fan of the blue and green! At $89.99 the cost of the seat is a bit more pricey that some on the market but if you get a chance to see one of these up close you can see why. The seat itself is super plush (much more padding than a traditional booster.. no more sore butts!) as well as padded armrests really makes a huge difference especially on a long car ride. 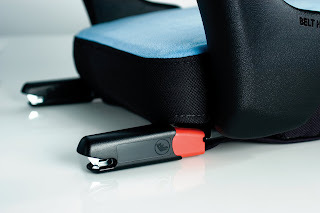 The latch option as well is not featured on any other booster seats that I have seen thus far. You can purchase your own Clek Booster seat directly from their web page as well as from most major retailers and Amazon!